Last summer, The Dining Room at the Scotch Malt Whisky Society on Queen Street underwent a substantial refurb, in advance of throwing its doors open to non-members. I’d dined in the bar area previously but the restaurant had always come across as slightly stuffy. But I’d been hearing good things about The Dining Room post-refurb, so I swung to find out what all the fuss was about. The most striking change is the reconfiguring of the building. The bar has been shifted downstairs, with The Dining Room moving upstairs. This lay-out makes much more sense, as The Dining Room has always felt crammed into the downstairs space. Both parts of the building have been beautifully finished but it was the atmosphere upstairs which really made the impression. The double-height windows of the Victorian townhouse give a great sense of light and airiness, which is coupled with clean lines and teal-coloured leather seating. It’s also the perfect size to have a bit of buzz about it on a Saturday afternoon, without feeling overly busy. For our visit, we opted for the three-course Menu de Jour, which is available for just £21.95 Tuesday to Saturday either at lunchtime or as a pre-theatre treat. All of the dishes on the menu were simply put together but have a few hero ingredients added which raise them to another level. My cured sea trout starter was meaty without being chewy, and accompanied by a Champagne vinegar and fennel. However, it was tart lemon gels cubes which really give the dish a fresh zing. For main, I opted for the flank of lamb, which just fell apart on the plate, and came with a deep, rich sheep’s yoghurt and potato puree. As you might expect, there’s hundreds of whisky available from the Scotch Malt Whisky Society’s impressive range. Rather than picking my own, I put my trust in the hands of the maître d’ to pair our desserts with a suitable malt. Three of us went for the boozy Rum Baba with chilled apricot soup, dark chocolate sorbet and praline. Rather than battling against these strong, sweet flavours with an even stronger whisky, it was paired with Chocolate mice and cinnamon spice – a 16 year old grain whisky from Loch Lomond distillery – which balanced off the sweetness of the rum. Our dining companion opted for the dark chocolate fondant, which was appropriately matched with Who’s for dessert? – a stonking 26 year old from Linkwood Distillery. 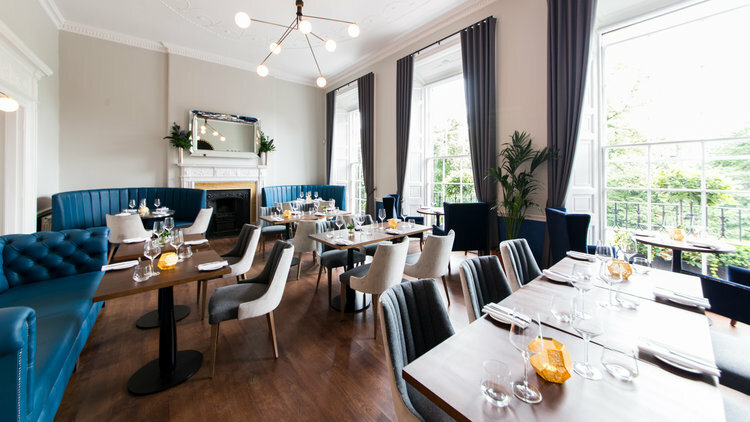 A welcoming atmosphere, top-class food and a whisky selection to die for, The Dining Room is a fantastic addition to Edinburgh’s food and drink scene. You can find out more about The Dining Room on its website. Our meal and drinks were covered by Scotch Malt Whisky Society.